1 year of Token Economy! Reading the inaugural issue and skimming through the next 51 you can see just how far the space has come, both in innovation, madness, and drama, as well as how fast it has moved. Hearing from you how much you enjoy reading Token Economy every week and seeing new readers subscribing from all corners of the world and industries has kept us going so far, but when Coinbase reached out offering to sponsor Token Economy we saw in there an opportunity to scale further and reach even more people. In issue #50 we commented on Coinbase acquisition of Paradex and alluded at an upcoming Q&A with its CEO Ron Bernstein. It took a couple of weeks to let the dust settle and the team decompress, but we finally managed to arrange it. So here you go! TE: You only started working on Paradex 9 months ago. What's been the main driver of your decision to exit now vs continue on the journey independently? RB: Over the past six months, we’ve seen an explosion of potential business opportunities Paradex could explore, like NFTs for example. After our first conversations with Coinbase, it was apparent that they had an amazing bird’s-eye view of the space and a very strong, mission-oriented drive to pursue those opportunities. We had a choice to explore those independently, or explore them mutually with the resources and brain trust they’ve built. It was an easy decision to make. TE: How does Paradex fit within Coinbase’s corporate strategy and portfolio of products? RB: Paradex signifies Coinbase’s seriousness in building an open financial system for the world, and shows their commitment to non-custodial, user-controlled products and decentralized protocols— things complementary to their core business. In terms of where we fit in the overall suite of products, Coinbase has been extremely respectful in giving us both leeway and runway to find our own footing. So, we’re focused less on interoperability and synthesis, and are just concerning ourselves with building the best relayer for our users. Opportunities for overlap and cross-pollination will come with time and adoption. TE: Binance is now building a DEX, Coinbase acquired one. Is there a future for 'pure-play' DEXs and, if so, what would that look like and what do you think will cause the inflection in adoption? RB: I really can’t say if the DEX and relayer space will be driven by small, niche teams hyper-focused in their specific protocols and competencies, or if larger, multifaceted blockchain companies will pursue those competencies in-house. I do think the inflection point comes naturally with further crypto adoption, and not necessarily related to asset price either. Where that tipping point is is unclear. But it all feels very early to me, and the momentum is extremely encouraging. TE: You have taken a pragmatic approach to designing Paradex using the 0x protocol, for example removing the need for the ZRX token. Are you going to continue building on Paradex from the existing architectural foundations or start from first principle inside Coinbase? RB: We'll continue to evolve Paradex to satisfy users. That means removing friction wherever possible. That's also consistent with Coinbase first principles: empowering users in a truly open financial system with the easiest to use set of tools. TE: If you'll continue building on 0x, is it rational to expect Coinbase to become a big holder of ZRX in order to influence its governance? RB: It will be interesting to see how V2 of the protocol gets integrated into the ecosystem in July and how a framework for future governance will start to form. The 0x team is incredibly thoughtful, and they ship solid software. I expect their approach to governance to be very well thought out too. TE: Continuing on 0x, should we expect congestions in the Ethereum network's as Coinbase starts funnelling its user base and liquidity to Paradex? RB: I'd consider that kind of a good problem, and also everyone's problem. If this turns out to be true, it validates the desire for more user-control of assets, and it'd be in everyone's interest to allocate time and resources to scaling so that congestion would be less of an issue. TE: Presumably there will be regulatory implications, the press release states that the service will open up “eventually to U.S. customers after we implement changes.” Can you give us some more colour on that and your views on how you think the regulatory environment will evolve in the US? RB: It’s no secret that regulators are actively trying to figure out what to do with crypto. Fortunately, a big part of the Coinbase brand is regulatory respect and a willingness to take in active role in helping inform the regulatory environment in which it operates. The different agencies are highly engaged and appear very mindful about not stifling innovation. Clarity will come with time. TE: Thanks for your time and insights Ron, and best of luck in your new role! We're starting to sound like a broken record in calling out crazy inflated valuations compared to the risk of most projects. Today we're not alone as Ella Zhang, who's with Binance Labs and needs to invest $1 billion in blockchain-related businesses (oh how we don't envy her! ), said the same thing. the Cryptocurrency Governance Initiatives, or CGI. Lots of good stuff in this. Even if people can write what they want, we find it incredibly easy to figure out who is in it for the right reasons. They envision a world in which all forms of value are tokenized on public blockchains and their mission is to create a tokenized world where all value can flow freely. Nothing extremely new, but a good post on the topic of "actual" smart contracts, which has been mostly neglected recently even thought it is one of the most interesting things that are enabled by all this new technology. I might have to change my mind around Tezos slowly.. Some useful evergreen tips from Meltem for how to get a job in crypto. Beyond the basics, writing great content and engaging in online discussions seem to be the highest leverage activities. The folks at CoinShares have produced an indepth research report in an attempt to debunk some of the claims about bitcoin network's energy consumption. It turns out prior reports were greatly exaggerated, according to their findings. An interesting post navigating through fun examples of the extensibility feature of NFTs and fungible tokens, enabling all sorts of new layer 2 experiences. "a civic shirt can now become a non-fungible token represented by the burning of 5 CVC tokens and a CryptoKitty. This non-fungible shirt with the Civic logo can now be worn on your CryptoKitty representing your loyalty to Civic. A completely new way to shill your favorite shitcoin!" As new smart contract platforms launch and newer ones emerge making big claims, this is a timely reminder of what Ethereum's head start is made of. Flowing nicely from the post just above, here's another well reasoned sceptical take on EOS DPOS consensus mechanism and the scenarios it may lead up to. "You may disagree with my conclusions, but the reason this system falls apart is because you have created a system in which incentives can be paid for. The cost in becoming a delegate is high, delegates will do what they need to mitigate the risk of loss through buying votes. Some users will undoubtedly be willing to sell their votes. There are individuals whose primary source of income may even lie in voting, which would be a valid economic contribution except for the fact that they aren’t the ones voting". PS: if you want to dig further, here's a dissection of another network that uses DPOS (Lisk). 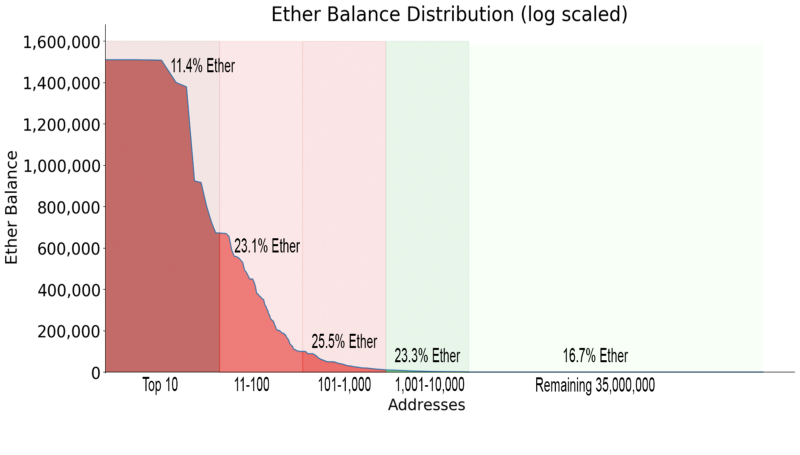 The team at TokenAnalyst have done an in-depth data analysis of Ethereum on-chain activity for a large number of addresses and generated some really cool charts to visualize the findings. Another fascinating in-depth data piece but on Bitcoin, produced by the folks at Chainalysis. 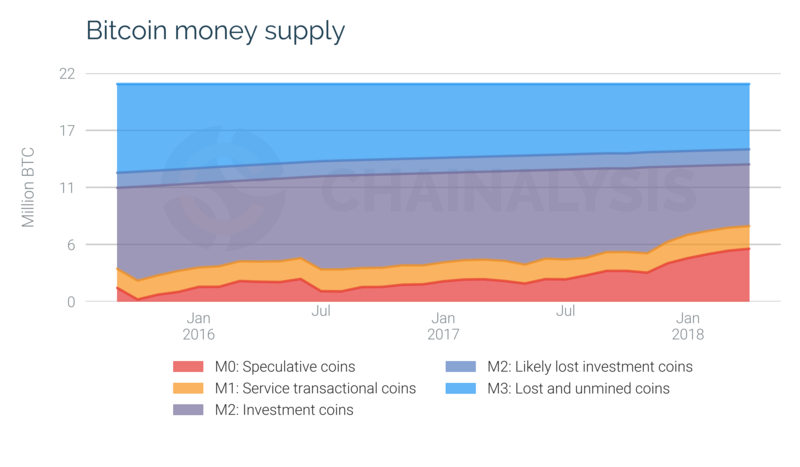 They break down the Bitcoin money supply into different clusters of liquidity and thus use cases, and plot changes over time. It's particularly interesting around the big sell-off earlier in the year. They also chart how velocity has trended over time, with and without the investment use case (it's been steadily decreasing). Vitalik's response to "Sharding centralizes Ethereum by selling you Scaling-In disguised as Scaling-Out"
This is a Medium response from Vitalik to the "Sharding centralizes Ethereum by selling you Scaling-In disguised as Scaling-Out" piece published this week. We link to the response because it's a good recap of the mining and validation process in Ethereum. Interestingly the CEO of Lazard this week vaguely hinted at cryptocurrencies as potential alternatives to the USD as reserve currency of the world. By now you must have all read the news of Microsoft acquiring Github for $7.5B. That inevitably sparked a heated debate in the crypto Twitter-sphere around the implications of a large corporation controlling a critical piece of web infrastructure like Github and whether that should instead be a decentralized public utility. The fact that Microsoft is involved made the broader reactions in the developer community even more spicy, given its history with Linux and OSS generally and it's M&A track record, albeit under Satya Nadella's leadership things have arguably turned around on both fronts. Point worth noting: despite being built on top of a open source protocol (Git), Github was already a for profit entity run in the interest of its shareholders, . Some used the analogy that Github is the Coinbase of Git: yes you can host your code elsewhere since Git is a public protocol, but the convenience of good UI, plus the network effects of the social layer, clearly appealed to 28M developers. Being VC-backed and revenue making ($300M according to sources), it was only a matter of time before an acquirer scooped it up. - A Reddit AMA with Nate Friedman, new Github CEO. Not strictly TE material, but a constant, painful reminder of the perils of relying on single points of failure for the privacy and security of our personal data. This time it sounds like 'only' email addresses and hashed passwords were potentially exposed, without evidence of further exploitation, but the thought of them holding DNA data for +100m plus users and the Black Mirror type scenarios of it being hacked makes us all shiver. - Wall st. Fidelity job posts suggest the large asset manager is planning to build a proprietary digital asset exchange as well as its own crypto custody solution. - IPOs. The video chat with Zooko seems to have sparked something in Jihan Wu, who now claims to be open to an IPO in Hong Kong. With his co-founder they own 60% of Bitmain, that booked $2.5B in revenues last year. - Lawsuits. In a weird turn of events, the former Chair of the SEC and her enforcement chief are now representing Ripple in a securities fraud class-action lawsuit. - R3. Rumours are circulating that R3, the makers of the Corda enterprise focused blockchain, is potentially heading into financial troubles in absence of another large funding round (or a positive settlement in the Ripple lawsuit). - Regulated. Coinbase has acquired a Finra-registered broker-dealer for its licenses to operate as a registered investment adviser and to run an alternative trading system. Pending regulatory approval, this would allow Coinbase to offer 'security tokens' and related services. Circle is also going down a similar path, seeking registration as a brokerage and trading venue with the SEC and then applying for federal banking license. - DEXs. Decred has published a new proposal for a zero-fee decentralized exchange that they intend to build collaboratively with the community. - Drama. Robbie Bent and Sina Habibian are out at TrueBit for unclear reasons. Say what you want, the infrastructure for digitizing securities on the blockchain continues to being laid. The Securitize team seem to be leading the way on this front, announcing a proposal for a protocol for developers to build 3rd party apps on and enable lifecycle management and compliance for digital securities. Components of the protocol include registry, compliance, comms and integrations with exchanges. Super solid new GraphQL project to get data out of dapps. The team is all former Mulesoft and I have a good feeling about this one. Some features that could be coming to a dapp near you soon: Filters, pagination, sorting and subscriptions with websockets. Cool new Demo from Bidali of their Ethereum based payments tool. I'm going to be poor. But in all honesty, wow - amazing. Aside from just the awesome possible combinations that could be created, this is a really interesting application of TCRs and crypto incentives. Is this the future of games? "Users submit black cards to a Token Curated Registry and create white cards that each have an associated bonding curve market. Players participate by buying into the white cards that match best with the black card in the current round. One black card is chosen at random for the round every 12 hours. Players can make money by selling a white card they bought into early, or by creating black cards that the community deems valuable!" If you are into stable coins, here's a one stop shop site with everything you need to know and read about existing and new projects, complied by Myles from Multicoin. SpankChain Camsite Launches into Public Beta! SpankChain has finally launched its camsite! Still very impressed by the execution speed and quality of this team. This video of Clayton speaking to the CNBC caused a lot of noise but quite frankly he hasn't really said anything new, unless we have misinterpreted his words. "A token, a digital asset, where I give you my money and you go off and make a venture, and in return for giving you my money I say 'you can get a return' that is a security and we regulate that. We regulate the offering of that security and regulate the trading of that security." He's only just said that securities are securities and they should be regulated as such, which we knew already. He still hasn't provided any additional clarity on the SEC stance on 'utility tokens' distributed at the point of network launch when the 'efforts of others' and 'common enterprise' prongs of the Howey Test don't necessarily apply any more. Does this make us closer to clarity? "Ms. Szczepanik will coordinate efforts across all SEC Divisions and Offices regarding the application of U.S. securities laws to emerging digital asset technologies and innovations, including Initial Coin Offerings and cryptocurrencies." Her first public comments in the new role were rather encouraging. Another creative deployment strategy for using all that XRP that Ripple has no idea what to do with. This time they're giving $50M to universities including MIT, University College London, Princeton, and the Australian National University for "research". Just your average Series B in China. "Hyperchain provides enterprise level blockchain platform with the technology of container cloud, core algorithm and management facilities"
It's above our paygrade to understand what that means. Republic finally announced its funding. The round ended up being led by Binance Labs, and NEO Global Capital, an affiliate of the public blockchain project of the same name. East Chain Co., Jeffrey Tarrant and Passport Capital also participated. As a reminder, Republic is the AngelList spin-off that offers crowdfunding to non-accredited investors and has recently gone very crypto. The cool thing in this raise is that they introduced a new instrument, the Simple Agreement for Future Equity and Security Tokens which combines all the previous SAF-s.
With the SAFEST, when the token is ready, pre-sale investors will have the option to take their full investment in tokens or up to 20 percent of their investment in equity. If for some reason Republic fails to launch the token, investors can convert all their investment into equity. EON is building a sort of game app store on top of Ethereum. The Singapore-based company announced a $5M seed round led led by Feng Li, Cherubic Ventures and Uphonest Capital. Unchained Capital raised a $3M seed round. As a reminder, they are offering fiat lending by getting BTC (and now ETH) as collateral. A solid business run with no hype.